An example card information screen from the game. 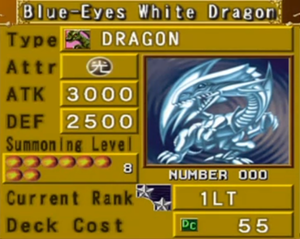 This is "Blue-Eyes White Dragon", card number 000, with a rank of First Lieutenant (1LT). This is a list of cards in Yu-Gi-Oh! The Duelists of the Roses. There are 854 playable cards featured in the game, numbered from 000 to 853, as well as two unusable story cards, "Red Rose" and "White Rose". A gallery of cards can also be viewed. 011 Serpent Night Dragon 53 Monster Card DARK Dragon 7 2350 2400 900-point bonus for battles against SPELLCASTER monsters. 013 Yamadron 44 Monster Card FIRE Dragon 5 1600 1800 Transforms surrounding spaces into NORMAL terrain when engaged in battle. Transforms surrounding spaces into NORMAL terrain when this card is flipped face-up. 017 Manga Ryu-Ran 48 Monster Card FIRE Dragon 7 2200 2600 Strong in TOON terrain. 041 Genin 20 Monster Card LIGHT Spellcaster 3 600 900 Strong in TOON terrain. 051 The Stern Mystic 32 Monster Card LIGHT Spellcaster 4 1500 1200 When this card is flipped face-up, all face-down cards are automatically flipped face-up. 054 Right Leg of the Forbidden One 15 Monster Card DARK Spellcaster 1 200 300 Awards victory to the one who brings together all four limbs and unleashes the monster. 055 Left Leg of the Forbidden One 15 Monster Card DARK Spellcaster 1 200 300 Awards victory to the one who brings together all four limbs and unleashes the monster. 056 Right Arm of the Forbidden One 15 Monster Card DARK Spellcaster 1 200 300 Awards victory to the one who brings together all four limbs and unleashes the monster. 076 Cosmo Queen 59 Monster Card DARK Spellcaster 8 2900 2450 When this card is flipped face-up, transforms the surrounding spaces within a range of two to DARK terrain. 077 Mask of Shine & Dark 43 Monster Card DARK Spellcaster 6 2000 1800 900-pt bonus for battles against WARRIOR types. 079 Dark Elf 33 Monster Card DARK Spellcaster 4 2000 800 For every battle engaged with the enemy, the LP of the player controlling Dark Elf is reduced by 50 points. 083 Lord of D. 28 Monster Card DARK Spellcaster 4 1200 1100 While this card is face-up in the defense position, all DRAGON monsters on the field are immune to the effects of an opponent's SPELL cards. 087 Dark Magician Girl 42 Monster Card DARK Spellcaster 4 2000 1700 When this card is flipped face-up, it is increased by 500 points for every Dark Magician and Dark Magician Girl found in all graveyards. 128 Dokurorider 43 Monster Card DARK Zombie 6 1900 1850 During movement, transforms terrain of entered space into WASTELAND terrain. 135 Skull Guardian 56 Monster Card LIGHT Warrior 7 2050 2500 900-pt bonus when battling FIEND monsters. When this card is flipped face-up, strengthens all LIGHT monsters by 300 points. 137 Kageningen 24 Monster Card DARK Warrior 2 800 600 Whenever damage is inflicted to LP in battle, the damage amount is reduced to 0. 143 Black Luster Soldier 60 Monster Card DARK Warrior 8 3000 2500 600-pt bonus when battling DRAGON monsters. 144 Wall Shadow 51 Monster Card DARK Warrior 7 1600 3000 Can move into LABYRINTH terrain. 145 Gate Guardian 77 Monster Card DARK Warrior 11 3750 3400 Whenever damage is inflicted to LP in battle, the damage amount is reduced to 0. 147 Hungry Burger 44 Monster Card DARK Warrior 6 2000 1850 Allows the one-sided destruction of the opposition when battling BEAST monsters. 148 Garma Sword 47 Monster Card DARK Warrior 7 2550 2150 800-pt bonus when battling SPELLCASTER monsters. 175 Eyearmor 16 Monster Card EARTH Warrior 2 600 500 When this card is flipped face-up, adopts the ATK/DEF of the monster with the highest attack power on the field. 188 Stuffed Animal 21 Monster Card EARTH Warrior 3 1200 900 Strong in TOON terrain. 189 Millennium Shield 35 Monster Card EARTH Warrior 5 0 3000 While this card is face-up in the defense position, all your monsters receive 1000 bonus points for their DEF. 195 Performance of Sword 43 Monster Card EARTH Warrior 6 1950 1850 900-pt bonus for battles against WARRIOR monsters. 220 Sengenjin 58 Monster Card EARTH Beast-Warrior 8 2750 2500 900-pt bonus for battles against ROCK monsters. 248 Super War-Lion 49 Monster Card EARTH Beast 7 2300 2100 If face-up, can move two spaces at a time regardless of terrain. 268 Fiend Reflection #2 30 Monster Card LIGHT Winged Beast 4 1100 1400 When this card is flipped face-up and a card has already been played from the hand, an additional card can be played from the hand. 270 Niwatori 22 Monster Card EARTH Winged Beast 3 900 800 While this card is face-up in the defense position, all recovery values to LP are doubled. 272 Harpie Lady 32 Monster Card WIND Winged Beast 4 1300 1400 When this card is flipped face-up, Harpie's Pet Dragon increases 300 points. 273 Harpie Lady Sisters 46 Monster Card WIND Winged Beast 6 1950 2100 When this card is flipped face-up, Harpie's Pet Dragon increases 900 points. 338 Fiend's Mirror 44 Monster Card DARK Fiend 6 2100 1800 While this card is face-up in the defense position, reduce opponent's Summoning Power by 1 point. 352 Chakra 50 Monster Card DARK Fiend 7 2450 2000 Revives in own Summoning Area, other than current location, when destroyed in battle. 353 Psycho-Puppet 49 Monster Card DARK Fiend 7 2000 2350 If the leader is a Mysterious Puppeteer, gains 1500 points when this card is flipped face-up. 362 Toon Summoned Skull 37 Monster Card DARK Fiend 6 2500 1200 Strong in TOON terrain. 382 Goddess of Whim 22 Monster Card LIGHT Fairy 3 950 700 Own ATK/DEF either increased or decreased by up to 1500 points when entering battle. 390 Hourglass of Courage 28 Monster Card LIGHT Fairy 4 1100 1200 If LP is over 1000 points when this card is destroyed in battle, the strength of your monsters are increased by 1000 points, and your LP is reduced by 1000. 401 Larvae Moth 9 Monster Card EARTH Insect 2 500 400 Transforms to Larva of Moth when strengthened with Cocoon of Evolution. 402 Great Moth 56 Monster Card EARTH Insect 8 2600 2500 While this card is face-up in the defense position, all enemy monsters are reduced by 100 points each turn. 403 Perfectly Ultimate Great Moth 70 Monster Card EARTH Insect 8 3500 3000 While this card is face-up in the defense position, all enemy monsters are reduced by 100 points each turn. 408 Jirai Gumo 33 Monster Card EARTH Insect 4 2200 100 Cancels all power increases or decreases of an enemy monster in battle. Does not cancel bonus effects such as terrain or Leader ability effects. Decreases LP by 100 points for each space moved. 417 Man-Eater Bug 16 Monster Card EARTH Insect 2 450 600 Destroys opposing enemy when this card is flipped face-up in battle. 422 Javelin Beetle 55 Monster Card EARTH Insect 8 2450 2550 600 bonus points added in battles against DRAGON monsters. 427 Larva of Moth 25 Monster Card EARTH Insect 2 0 2000 Cannot move. Transforms into Pupa of Moth if this card survives 5 turns in face-up, defense position after being flipped face-up by the controlling player. If destroyed prior to transformation, the card is revived as Larvae Moth in own Summoning Area other than current location. 428 Pupa of Moth 25 Monster Card EARTH Insect 2 0 2000 Cannot move. Transforms into Perfectly Ultimate Great Moth if this card survives 1 turn in face-up, defense position after being flipped face-up by the controlling player. If destroyed in battle, the card is revived as Great Moth in own Summoning Area other than current location. 429 Arsenal Bug 50 Monster Card EARTH Insect 3 2000 2000 All spaces within an area of 2 spaces are transformed into FOREST terrain. If an INSECT monster is Leader, this card's power is strengthened by 1500 points when this card is flipped face-up. 472 Fortress Whale 50 Monster Card WATER Fish 7 2350 2150 Automatically destroys WARRIOR monsters in battle. 509 Blast Juggler 22 Monster Card FIRE Machine 3 800 900 All cards located in the surrounding 3×3 area are automatically destroyed when this card is destroyed in battle. 514 Machine King 47 Monster Card EARTH Machine 6 2200 2000 When this card is flipped face-up, this card is strengthened by 100 points for every MACHINE monster on the field. 528 Kinetic Soldier 47 Monster Card EARTH Machine 3 2350 1800 Increases 2000 bonus points in battles against WARRIOR monsters. 563 Roaring Ocean Snake 49 Monster Card WATER Aqua 6 2100 1800 When engaged in battle, transforms the space it occupies into Sea terrain. 668 Woodland Sprite 47 Monster Card EARTH Plant 3 2100 2100 Power increases by 2500 points in battles against FIEND monsters. 672 Jowls of Dark Demise 18 Monster Card WATER Immortal 2 200 100 When this parasite card is flipped face-up in battle, it takes control of the opposing card. When the controlled monster is destroyed in battle, this card is revived in the controlling player's Summoning Area, other than its current location. The nature effect and destruction features of the monster that's taken over are rendered ineffective. Transforms adjacent spaces into CRUSH terrain when this card is destroyed in battle. 673 Souleater 27 Monster Card EARTH Immortal 4 1200 0 When this card enters a turn face-up and in the defense position, all MONSTER cards are removed from the respective Graveyards, and the number of these removed cards are multiplied by 200 points. The result is added to the power of this card. 674 Slate Warrior 38 Monster Card WIND Immortal 4 1900 400 When this card is flipped face-up, all your IMMORTAL cards are strengthened by 500 points. 675 Shapesnatch 44 Monster Card DARK Immortal 5 1200 1700 Shapesnatch's ATK and DEF copies the enemy Leader's ATK for attacks and your own Leader's DEF when defending. 676 Carat Idol 72 Monster Card LIGHT Immortal 9 2600 3100 (Nature Effect) When this card enters a turn face-up and in the defense position, all cards are drawn 1 space towards Carat Idol! (Destruction) Transforms adjacent spaces to CRUSH terrain when this card is destroyed in battle! 677 Electromagnetic Bagworm 31 Monster Card LIGHT Immortal 3 200 1400 When this card is flipped face-up, a player gains control of all opposing MACHINE monsters for the turn in play. 678 Timeater 51 Monster Card DARK Immortal 6 1900 1700 While this card is face-up in the defense position, the countdown speed for spellbound cards are doubled should a Turn Count be involved. 679 Mucus Yolk 16 Monster Card DARK Immortal 3 0 100 Each time Mucus Yolk moves, an opponent's LP is reduced by 50 points. 680 Servant of Catabolism 27 Monster Card LIGHT Immortal 3 700 500 While this card is face-up in the defense position, an additional point is added each turn during the recovery of the player's Summoning Power points. 681 Rigras Leever 32 Monster Card FIRE Immortal 3 1600 100 When this card is flipped face-up, all players must discard their current hand to their respective Graveyards. 682 Moisture Creature 72 Monster Card LIGHT Immortal 9 2800 2900 While this card is face-up in the defense position, the opposing leader's powers are rendered ineffective. 697 Labyrinth Wall 35 Spell Card Transform the occupied space into LABYRINTH terrain. 700 Raigeki 80 Spell Card Destroys all monsters located in vertical and horizontal lines from the activated space. 707 Dian Keto the Cure Master 60 Spell Card If LP is 4000 or below, the number of points is increased to 4000. 719 The Inexperienced Spy 35 Spell Card Regardless of facing, Type icons of all opponent's card are displayed on the Field for 5 seconds. 733 Brain Control 80 Spell Card Take control of opponent's highest ATK monster for 1 turn. 751 Creature Swap 75 Spell Card All cards in play on the Field with the exception of the Leaders are transported to contrasting spaces diagonal to their current positions. 789 Riryoku 99 Spell Card Reduces opponent's LP by half and adds the reduced amount to the powers of all monsters. 812 Widespread Ruin 60 Trap Card Disposable trap that triggers against any enemy card and destroys every card located within a 3×3 space area. 821 Anti Raigeki 5 Trap Card Permanent trap that triggers when Raigeki is activated, and nullifies the card's effect. 827 Mirror Force 99 Trap Card Disposable trap that triggers when an enemy initiates an attack against your Leader or other cards on the field. Destroys every one of your opponent's attack-positioned cards on the field. 830 Curse of Millennium Shield 5 Ritual Card Sacrifice 3 monsters with DEF of 2000 or higher to summon Millennium Shield. 832 Gate Guardian Ritual 5 Ritual Card Sacrifice Kazejin, Suijin and Sanga of the Thunder to summon Gate Guardian. 833 Black Luster Ritual 5 Ritual Card Sacrifice 2 monsters with ATKs of 1500 or lower with Gaia The Fierce Knight to summon Black Luster Soldier. 835 War-Lion Ritual 5 Ritual Card Sacrifice 2 BEAST monsters with Leogun to summon Super War-Lion. 837 Ultimate Dragon 5 Ritual Card Sacrifice 3 Blue-Eyes White Dragons to summon Blue-Eyes Ultimate Dragon. 840 Revival of Sennen Genjin 5 Ritual Card Sacrifice 2 BEAST-WARRIOR monsters and Millennium Golem to summon Sengenjin. 841 Novox's Prayer 5 Ritual Card Sacrifice 2 WARRIOR monsters and Mystical Elf to summon Skull Guardian. 842 Curse of Tri-Horned Dragon 5 Ritual Card Sacrifice Curse of Dragon, Feral Imp and Koumori Dragon to summon Tri-Horned Dragon. 843 Revived Serpent Night Dragon 5 Ritual Card Sacrifice 1 WARRIOR monster, 1 WINGED-BEAST monster, and Darkfire Dragon to summon Serpent Night Dragon. 844 Turtle Oath 5 Ritual Card Sacrifice 2 AQUA monsters and 30,000-Year White Turtle to summon Crab Turtle. 846 Resurrection of Chakra 5 Ritual Card Sacrifice 2 monsters with ATKs of 1000 or less and Versago the Destroyer to summon Chakra. 848 Javelin Beetle Pact 5 Ritual Card Sacrifice 2 INSECT monsters and Hercules Beetle to summon Javelin Beetle. 849 Garma Sword Oath 5 Ritual Card Sacrifice 2 WARRIOR monsters and Swordstalker to summon Garma Sword. 850 Cosmo Queen's Prayer 5 Ritual Card Sacrifice Queen of Autumn Leaves, Princess of Tsurugi and Dark Elf to summon Cosmo Queen. 851 Revival of Dokurorider 5 Ritual Card Sacrifice 1 ZOMBIE monster, 1 MACHINE monster and 1 INSECT monster to summon Dokurorider. 852 Fortress Whale's Oath 5 Ritual Card Sacrifice 2 FISH monsters and Mech Bass to summon Fortress Whale. 853 Dark Magic Ritual 5 Ritual Card Sacrifice 2 monsters with ATKs of 1500 or less and Dark Magician to summon Magician of Black Chaos. This page was last edited on 18 April 2019, at 21:33.